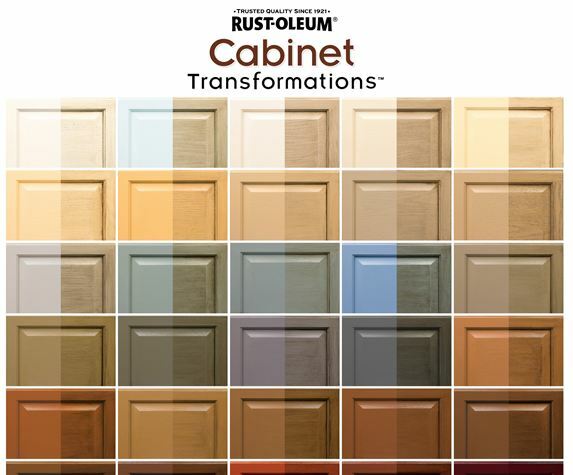 I was among the first group of journalists to test the Rust-Oleum’s new product — Rustoleum Cabinet Transformations — when it was first introduced in early 2011. On this page, I gather together all the stories I’ve done about this project since then — with the goal of helping potential users can see it easily. Disclosure: Rust-Oleum has not paid me for this review. They did pay for my trip to test the product and for a kit that I later used on my mom’s vanity. They also advertised on my site at one point but are not currently. Opinions are my own, and those of my readers — my goal is to lay it out as we find it. 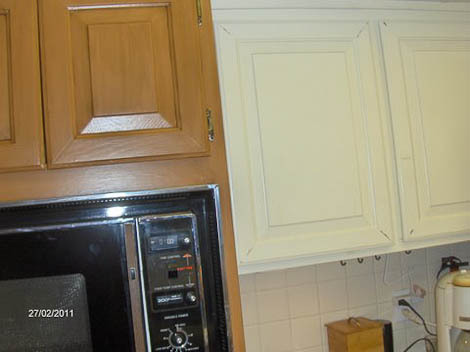 Rust-Oleum Cabinet Transformations is a kit that includes a number of the key products that you need to repaint your kitchen cabinets in pretty much four steps: (1) Clean and degloss, (2) Paint / usually two coats, (3) Glaze / optional, (4) Topcoat / usually two coats. Rust-Oleum provides ample instructions, read them carefully before starting. First, we’re now living in the “New Normal”, so who wants to spend money on new kitchen cabinets if they don’t absolutely need to? This kit helps you achieve professional-quality results on your own — at a dramatically less price. At the same time, I thought the quality of the finished cabinets looked very good — and in particular, the glazed cabinets have that high-end look. 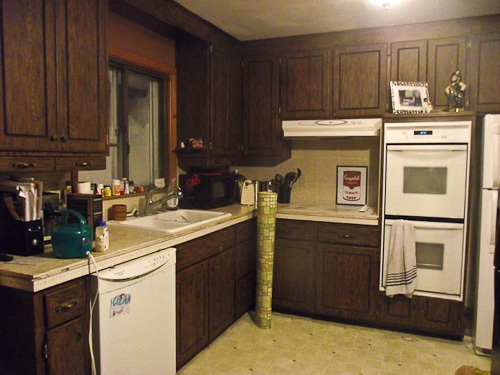 This system does not require that you strip and sand your cabinets – what a pain that is. Instead, you use a liquid cleaner and deglosser provided in the kit. Close the heating and air conditioning vents to the room you are working in, so that the blower does not send dust particles onto your project while any of the finishes are drying. 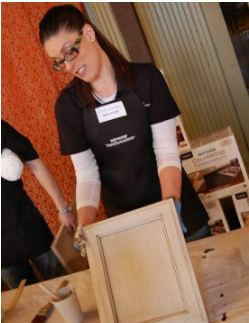 Be very careful to know whether you are working on real wood or wood veneer — or on laminate. There are different processes depending on which you have. I say this, because as it turns out, I am pretty sure the side of mom’s vanity was laminate; it got kind of scratchy after I used the kit sponge on it. It still was “all right,” but I could see the difference. Always try to complete each step for the entire project at the same time. I got “off” in my sequencing of doors at one point, and it was real pain. For example: Use the tops on how to be able to turn over doors and get both sides painted in the same wave. 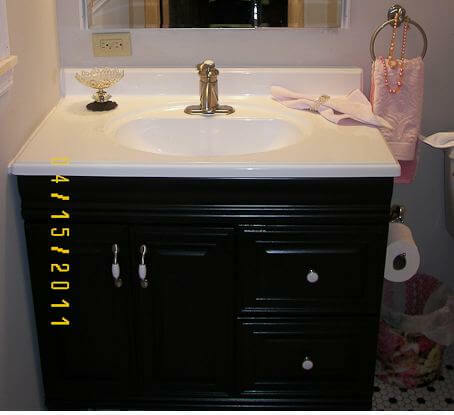 See more photos from the renovation of my mom’s bathroom here — it was black-and-white 1940s style. What a great, great product. Tell Rustoleum they’re welcome to come over and shoot a commercial here if they want to. I wouldn’t want to be in it – I’m 59 years old and well past my expiration date. That’s what actressess and spokesmodels are for! I love the Rustoleum Cabinet Transformations – I swear I’m about ready to buy stock in the company. Connie also converted her doubting Dear Husband into a believer. By Room 2 of painting, she said, he made her drying racks and was taking down all the doors. Connie was a very early user of this product. It was based on her feedback — along with feedback from other customers, I am sure, that Rustoleum added more glaze to the kits. Read Connie’s detailed story here — and see many more of her before-and-after photographs. 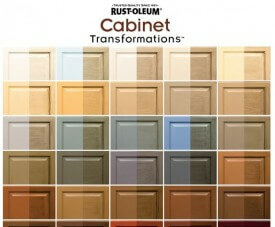 Rustoleum offers a variety of “stock” tinting colors. But, you can tint their base any color — you’ll have to work with a patient and trained paint department, though, as every paint base takes color differently. If you buy the large kit, which has two cans of paint, you can tint each can a different color. You do not have to choose only from the colors that Rustoleum offers. You can custom-tint the base paint color any color you wish. However, if you do this, you are going to have to work with a paint store that will fuss with you. Also: You will likely need to be “forgiving” of the final color you get — because, unless Rustoleum has exactly formulated the color, you won’t “really” know how your test will turn out, as every paint base takes tint colors differently. So, talk to your paint department about the risks before moving ahead with a custom tint. 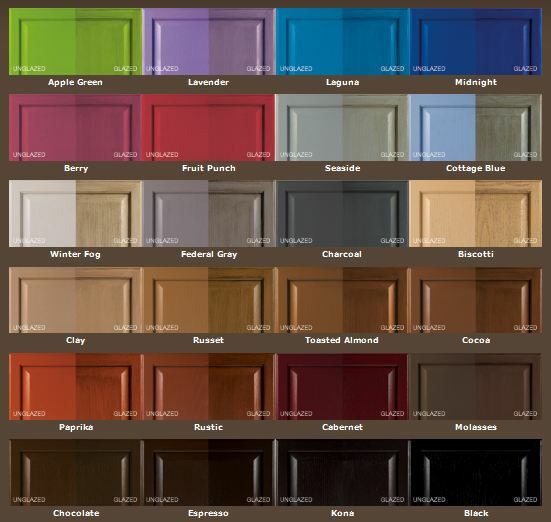 Idea for how to choose the paint color for your kitchen cabinets if you are going for a wood tone: How about matching the color of the wood trim elsewhere in the house? 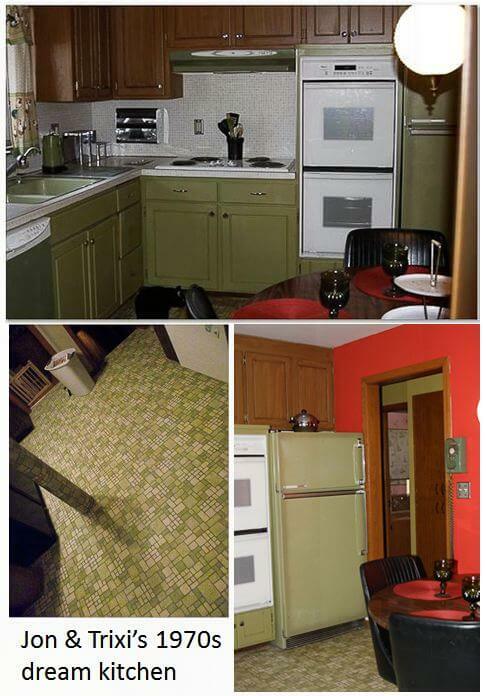 Lots more photos of Jon & Trixi’s 1970s avocado dream kitchen here. 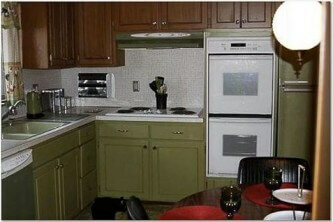 All of the readers who reported back to me used relatively dark colors on their cabinets. Surfing around looking at some other reviews, I see some reports that “coverage” using the solid white (as one example) may not be as good as when you use the darker colors. Apparently, this is not such a “problem” if you are going to use glaze. But if you want a solid light color, read on. My two “source stories”: DIY painter who was not happy with solid white… and DIY painter who was happy with white with a glaze. Bottom line: Be sure to read all the instructions. Note: This product will not cover up the grain of the wood. The grain will show through. 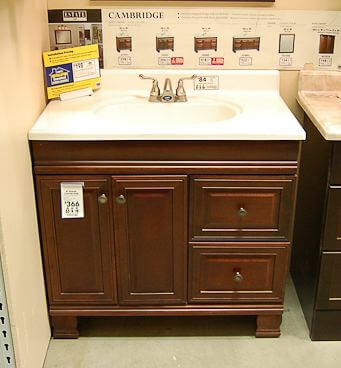 So, if you want a “smooth” cabinet with no wood grain showing at all, you probably should consider another process. Do you want to paint just one piece of furniture using this system? Rust-Oleum continued with their line extension with an even smaller kit with the products sized to paint furniture (rather than an entire kitchen). They also have some different, kind of wilder colors — like Apple Green (I like! ), shown above. Again, though, I think you can tint colors to any color you want, although you will need to work with a helpful and experienced color-tinter. I have not written about or reviewed the furniture painting kit – you can read about it on Rust-Oleum’s website, though. Finally, if you have wood cabinets — and you want to freshen the wood finish (rather than paint it), Rust-Oleum has introduced a kit product to do that, too. It’s called Rust-Oleum Wood Refinishing System, and you can read about it here. No reviews yet from any readers. 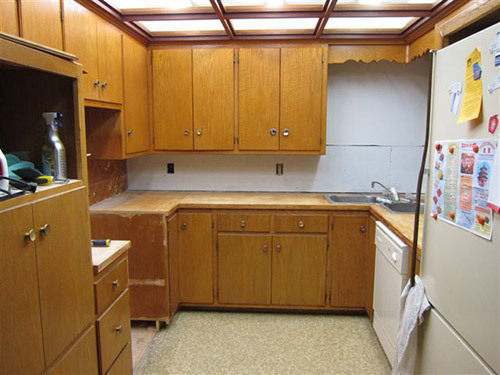 Reader Rebecca’s 1963 kitchen is in need of some TLC. She already has come up with a great solution to swap a wall oven with a full size stove — which she documented on her blog, The Vintage Life. But now she’s stuck. Rebecca will use Formica aqua boomerang laminate on the counter tops… she has picked out a mosaic tile back splash… and she’s decided on a wall color. 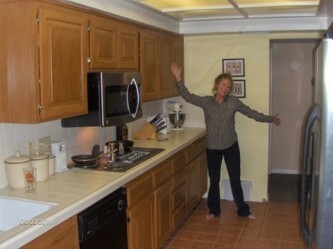 Her final dilemma: What color to paint or refinish the faded chippy wood kitchen cabinets? 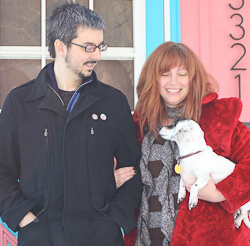 Jon and Trixi — we’ve seen portions of their project under way — have finished remodeling their kitchen, and are mostly done with the bathrooms. And in a twist that I am sure the folks at Rust-Oleum were not anticipating, the epicenter of their “Retro Renovation story” is that they freshened up their kitchen cabinets by painting them warm brown on the top — and avocado on the bottom — using Rust-Oleum’s Cabinet Transformations kit. No, avocado ain’t a stock color in the Rust-O kit — Jon is intrepid, and had it custom-tinted avocado at his local store. Jon wants me to emphasize that all of the work they did throughout the house cost less than $2,000 — because they (1) used their existing, functionally sound cabinets (2) uncovered the vintage countertop and floor (3) hunted down salvage and vintage fixtures and furniture and (4) did the work themselves. I luv it! Click on through for their compete story along with 21 photos live from the scene. Photos by Glenn Suckow and Trixi Hunt — many thanks!